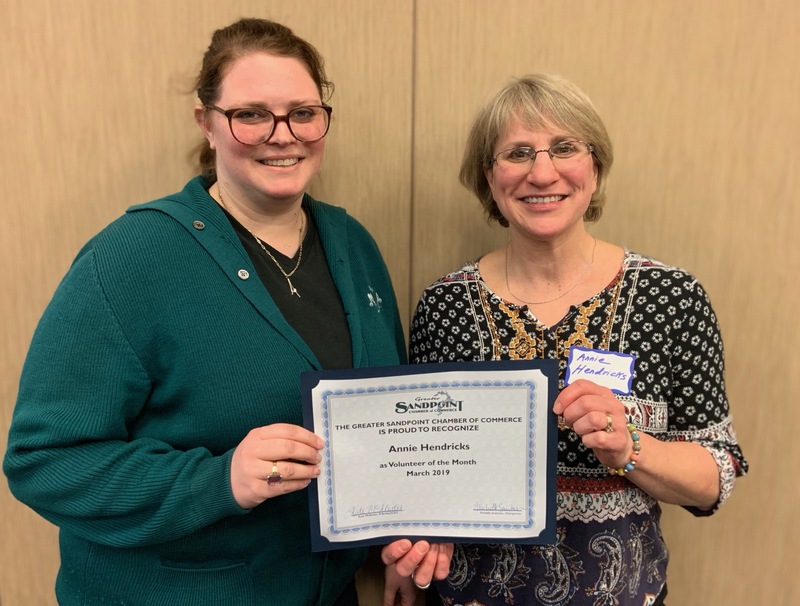 Please join the Greater Sandpoint Chamber of Commerce in congratulating their March Volunteer of the Month, Annie Hendricks. John and Annie Hendricks moved their business from Seattle to Sandpoint in 2006 with 3 small children and set up their office for Hendricks Architecture on Pine Street. The business has grown over the years with projects ranging from small cabins, mountain and lake homes to lodges. These projects are not only spread throughout Bonner County but throughout the US and have been featured in several printed and digital publications. Annie manages the office and has a great boss who gives her flexibility and time to volunteer in a variety of areas; most of which are related to her children’s school, church, sports and activities. Education has always been a top priority for Hendricks and her presence at her children’s school has been constant. She has served as the Sagle Elementary PTA President for six years, is a current Care board member, Graduation night volunteer, Idaho Tech Mars Rover parent volunteer, Parent Volunteer for Sandpoint Middle School and Sandpoint High School Band, Kaleidoscope art program, Junior Achievement teacher volunteer for 8th grade. Outside of school activities, she has spent 8 years as Den leader for her boys Cub Scout troop, 2 years as Cub Master, Secretary of her church council for seven years, current Treasurer of Little Lambs School Board, class volunteer for preschool, children’s church teacher and coordinator, and active in Vacation Bible School, a Chafe 150 volunteer, and a coach and team manager for countless athletic teams. Hendricks says even though her children are grown, this is not slowing her down. “The kid’s activities are scarcer, but now I can volunteer for things like Beerfest and Winter Carnival.” She not only sponsors, but volunteers for Beerfest, Scenic Half, Summer Sampler, and Winter Carnival. She provided an elaborate complimentary hot chocolate bar at the Winter Carnival After Party, complete with different flavors, whipped cream, chocolate sauce, and matching outfits for her and her crew. Hendricks is also a Chamber Ambassador. Thank you, Annie, for all your hard work and dedication to the chamber and our community over the last 12 years. 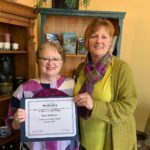 Annie Hendricks is the Greater Sandpoint Chamber of Commerce March Volunteer of the Month. 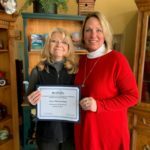 Chamber Office Manager & Membership Specialist Ricci Witte presents Annie Hendricks with Volunteer of the Month at the General Membership Luncheon on March 14th.